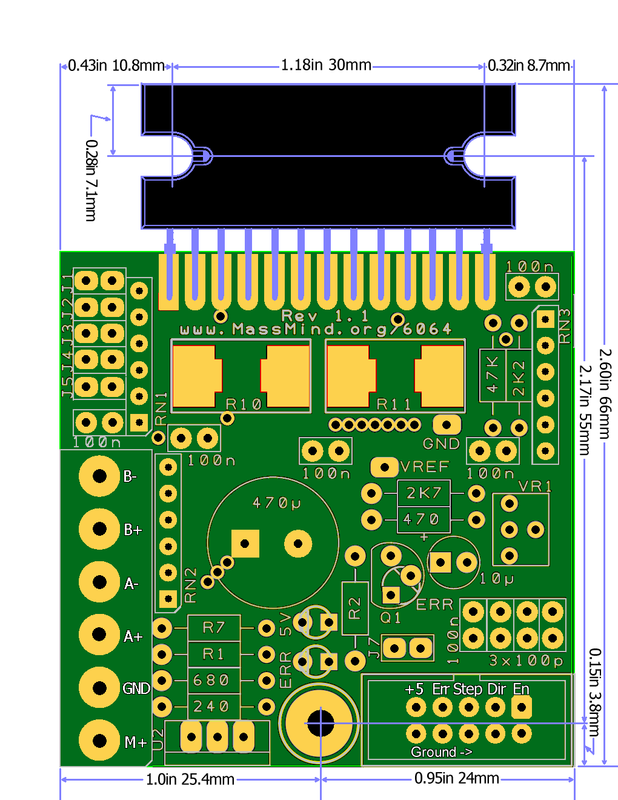 Luc's THB driver joins the other open source drivers supplied by the MassMind.org store, adding support for BiPolar (4, 6 or 8 wire) motors up to 4 amps/phase at 50 volts. 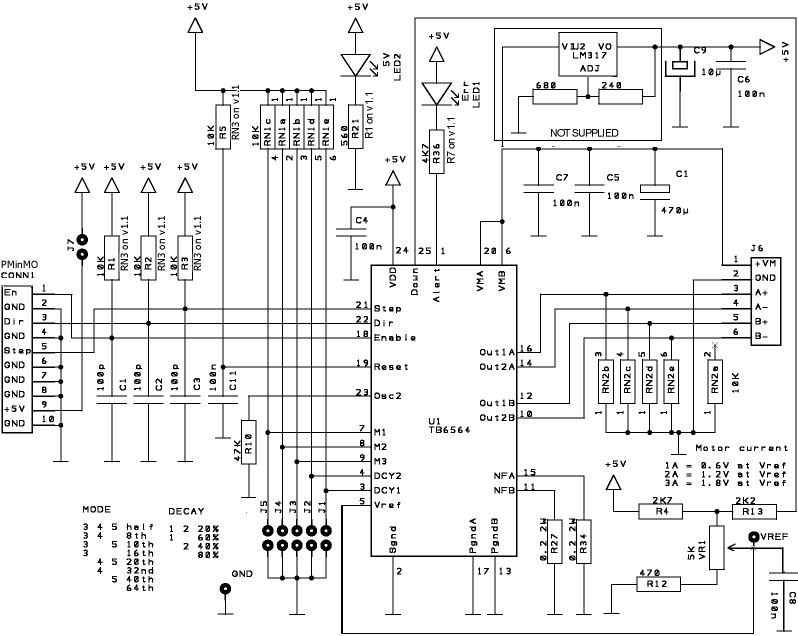 It is based on the new THB6064AH ( Datasheet ) chip (also known as the Toshiba TB6564AHQ^) which is a design improvment over the TB6560, adding support for better microstepping, lower resonance, and protection for power on sequence^. Please do NOT use the schematic to assemble the kit. Please follow the written instructions below or watch the video. 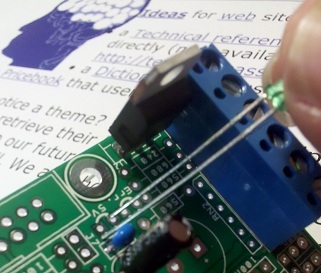 If you are not an expert at soldering, PLEASE read through our soldering class first. J7 1 Header 0.1" 2x1 shorted to provide +5 volts from PMinMO connection. R7 1 4K7 Ohm ¼W Error LED current limit, LED will be very dim, but a lower resistor will blow the output. R2 1 On Rev 1.1 PCB, R2 is not needed for the standard error LED which is installed at Q1, not below the 5V power LED. On the original and rev 1.1 of the PCB, you can provide the +5 logic power from the motor power supply by adding a voltage regulator. This will not fry the THB6064AH they way it will fry the TB6560, because it protects against latch up on start. Here is a video on the assembly. For Rev 1.1 PCB's: Note that this option is not supplied with the kit, and is a non-standard , use of the PMinMO connector to feed back an error condition to the PC or other motion controller. The error pin from the THB6064AH has very limited drive strength. To safely drive an input back to a PC, it needs some amplification. For this option, R7 should be 10K, and a standard switching transistor (e.g. BC557) installed as Q1 to provide an amplified error signal. 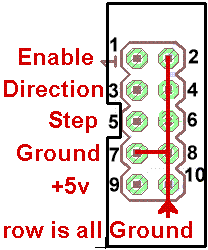 In this case, R2 can be a ~560 Ohm resistor which will not only drive an error LED installed on the side of R2 near the mounting bolt, but which can also be routed to pin 7 of the PMinMO header by cutting the trace which connects pin 7 to the ground pin 8, and then wiring pin 7 to R2. The Version 1.2 PCB adds two extra holes on the PMinMO connector at lower right so that terminal blocks can (optionally) be used instead of a 2x5 header. In that case, note that the terminals don't carry logic power. And so either the 5 volt power regulator must be installed, or a 2 pin header installed between the right pad of J7 and the GND pad just above it and logic power supplied there. 2. [ ] Resistors: There are several different values of resistors and a lot of the values look alike. Take care and be sure you have it right before you proceed. For example, there are 47K, 4K7, and 470. 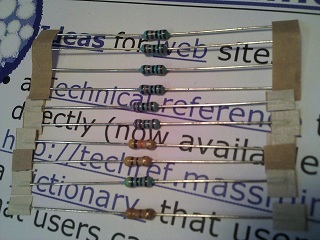 And there is a mix of 4 and 5 band resistors (low and high precision). 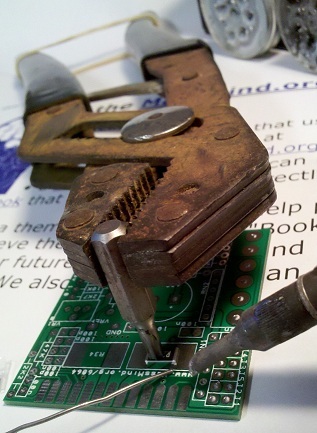 Getting them right is harder than you think, certainly harder than soldering surface mount components. An amazing percentage of people are, at least partially, color blind. Some don't know it until they start trying to sort out resistors. And even if you aren't, it takes a strong light and good luck to tell orange from gold or brown from purple on some of these packages. If you must read the bands, start by arranging them with the colorful bands to the left. In most cases, that will give you the correct order, with the tolerance band on the right and the actual value reading from left to right. There are exceptions. The 5 band 10K resistors currently supplied with the kit are brown, black, black, red, brown (1, 0, 0, two more zeros, and a 1% tolerance). Read it each way, figure out which one makes more sense given the resistors in the set... and then check it with your meter. Really... For less than $25 you can get a half way decent digital multimeter (watch out, it doesn't include the special battery) from your local Radio Shack right now or order one from eBay china and wait a month for it to show up. Believe it or not, WalMart (gag) sells a pretty good one in most of their stores: The "Equus 3320 Innova" for about $20. The PCB is marked with the values rather than the component name to eliminate another possible source of error in transcribing the part (R1) to the value (10K) to the actual physical component (brown, black, black, red, brown OR brown black orange gold). There wasn't room to put the colors on the PCB. Now you just go from value to component... Mostly; a couple of the resistors are marked Rsomething because the value supplied could change. R1 (aka R21) may actually be anything from 330 up to 1K. This is not a critical value component. Populate the other resistors first, and whatever is left over, should be a value in that range. On the Rev 1.1 and up PCB, the "ERROR LED" resistor (originally R36) is labeled R7 on the new board and is the 4K7 resistor. The red LED should be installed to the right of R2 above J7 with the long lead in the square hole marked Q1 and the short lead up and to the right in the round hole nearest the "E" in ERR. R2 is not used. This provides a simple error indicator via the LED and no amplification of the error signal. On the Rev. 1.0 PCB, the resistor supplied for R21, to pin 1 of RN2, which is marked on the PCB as being 560, may actually be anything from 330 up to 1K. This is not a critical value component. Populate the other resistors first, and whatever is left over, should be a value in that range, and should be installed for the 560 or R1. Also, the value for R36 (next to the Err LED) is incorrectly printed as 560 when that resistor must be a 4K7. Place the supplied 4K7 resistor in the position marked "560". 3. 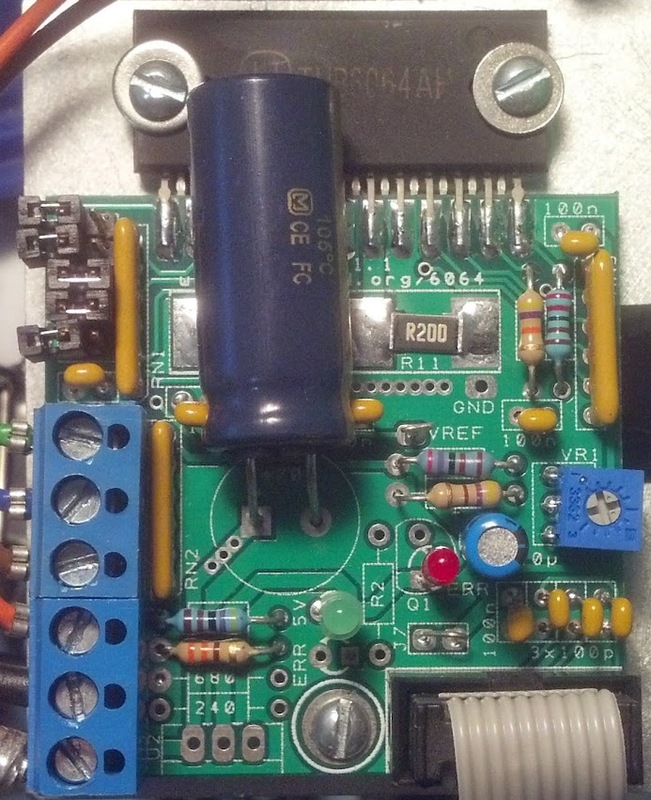 [ ] Variable Resistor: This is the drive current adjustment. It can be installed either way but being able to get in there to turn it is the trick. Make sure you will be able to get to it after installing the other components. On PCB Rev 1.1, it's probably best to install it facing the edge of the board. If you install it facing the capacitors, and you leave about ¼ of lead between each capacitor and the PCB, you can bend them over out of the way after they are soldered down and so clear a path to adjust the current. Take care not to melt the case by letting each lead cool a bit after soldering. 4. [ ] Network Resistors: It's all about the dot. Network resistors all have a (very tiny, dimly printed, very hard to see) dot at one end, usually down next to the pin. That pin is pin 1 and pin 1 goes in the square hole. Bend the outermost pins out so it won't fall down when you turn it over to solder it. Then push the pins back down so they are just through the hole so you leave a little lead on the component side. 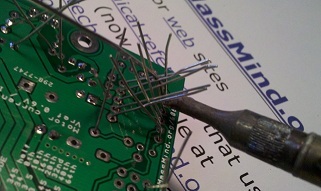 Solder one pin, check positioning, and solder the rest. 5. [ ] Capacitors: The little capacitors will be marked with a number: 101 or 104 which represents the first two digits and the number of zeros in pico Farads. 101 is 100pF. 104 is 100000pF or 100nF or 0.1uF. So the ones marked 100n on the PCB get the 104's and the 100p's get 101s. On the Rev 1.1 PCB, all the caps are clearly labeled and do not get in the way of the current adjust pot. Errata: Rev 1.0 PCB only, watch out for the block of caps between VR1 (the current adjust potentiometer) and the top of the board; the top cap is 100p, not 100n. The 100n is the second one down. The next two are 100p. Note: Be sure to install those caps next to the current adjust potentiometer in such a way that you can bend them down clear of the screwdriver so you can make that adjustment. 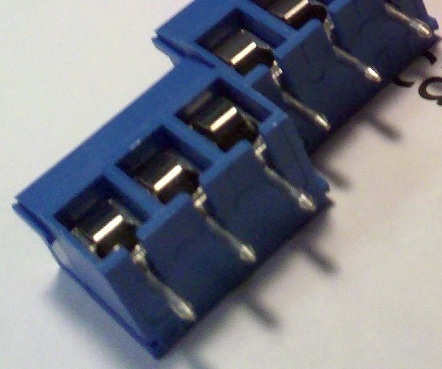 The medium and large electrolytic caps go in with the long lead in the square hole, and the stripe side towards the round hole. And the really big one is an exception to the "leave some leads" rule. It can be installed all the way down on the PCB for physical stability. And it's probably best to set it aside and come back to it after you have done all the other components. 6. [ ] Terminal Blocks: Slide the two sets of terminal blocks together so that the rail and groove interlock. 7. [ ] Unless you are installing the onboard logic power regulator option, use one of the clipped resistor or other component leads to short J7 so you can get logic power via the PMinMO header. The PMinMO header can be connected to the 4Axis board, or directly to a PC parallel port cable. You can provide power on that PMinMO header, pin 9 from the 4 Axis board, a USB port, or your own 5+ regulated power source. If you keep that J7 jumper wire up off the board a little, it makes a great test point for logic power. [ ] If you do install the onboard logic power regulator option, the LM317 goes in U2, with the tab towards the outside of the PCB, and the 240 and 680 ohm resistors are just above it. Note: you may be supplied with a 330 ohm resistor (that goes in place of the 240) and a 1K (instead of 680); 330/1000 is actually closer to 5V. Keep in mind, you will be applying >9 volts to VM+ when testing logic power below. 8. [ ] Test Points: Form loops from a couple clipped leads and push both ends into the hole for the VREF test point and the GND test point. 9. [ ] Jumpers: When you solder on the 2x5 header for the options jumpers and the shrouded 2x5 PMinMO header, it's a good idea to bounce around in the pin order rather than just going down the line. It keeps the plastic from getting soft and perhaps not holding the pins straight. Note the notch in the shrouded header is towards the resistors. On the Rev 1.1 board, the order of the option jumpers has been re-arranged in numerical order. 10. [ ] LEDs: The long lead goes in the square hole, leave a little lead so the LEDs are up off the PCB and where you can see them. On the Rev 1.1 PCB, with a standard build, the Red "ERR" LED should be installed above J7 and right of R2 (long pin in the square hole as always) and NOT under the 5V indicator LED. If you want to feed back the error signal to your controller see the "Rev 1.1 Option 2 "AMPLIFIED ERROR FEEDBACK" text above. This is not recommended. Dont' forget the big Capacitor if you left it for the end. Assembly time to this point is about 30 minutes. Then apply 5V logic power at pin 9 of the PMinMO header. Now the 5V logic power system can be checked, the +5v led should be on and the Vref can be measured and adjusted to a low value: 0.4-0.5V. Power off and prepare for finally assembly. 15. [ ] Set decay and mode by adding or removing jumpers. You might start with only 2 and 3 jumpered: 40% decay and 16th microstepping. 17. [ ] Now connect the step and direction signals and spin the motor. These should be < 0.8V when low and > 2.0V when high. The Vref reading should increase to your desired amperage setting divided by 1.667 while the motor is in motion, and drop back down when you stop it. Let it work for at least 10 minutes to verify that nothing is overheating. KILLspamddg2~NOSPAM~ at STOPspamlive.nl asks: " how to connect to mach3 ? are the input pin's of the tbh6064ah Active when they are connected on GND ? 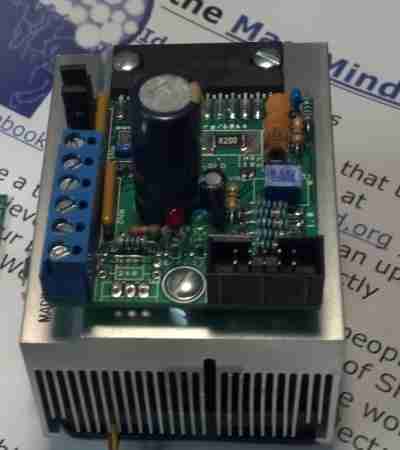 Thanks, I love to hear from you" + James Newton of MassMind replies: We have some info on setting up with Mach3 here. Each input is different. Direction is CCW when high, Step takes action on the rising edge (from low to high), and Enable is active high."